Save a life…preserve a lemon! I can already tell you, the $95 spent on my citrus tree was the best money I’ve spent in a long time. In itself, it is the coolest thing. I call it my “frankenfruit tree” – a Meyer Lemon tree with Naval Oranges and Bearss seedless limes grafted on to it. One tree, three fruits!! Simply amazing in my mind. This year the tree only fruited lemons. A lot of lemons, but I was not complaining. And they all came about 2 weeks before Christmas, perfect for gifts! After making 4 or so batches of lemon curd, I was getting a bit tired of it though. Besides, that is a LOT of butter. 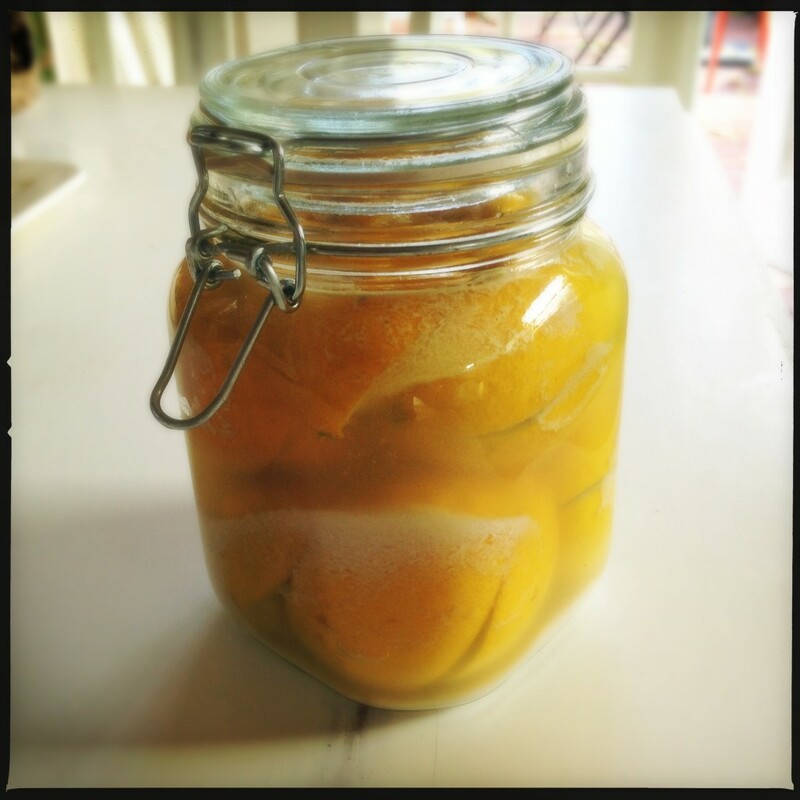 So I turned to something I’ve always wanted to do – preserve lemons! The recipe I wanted to use was easy to find right away. 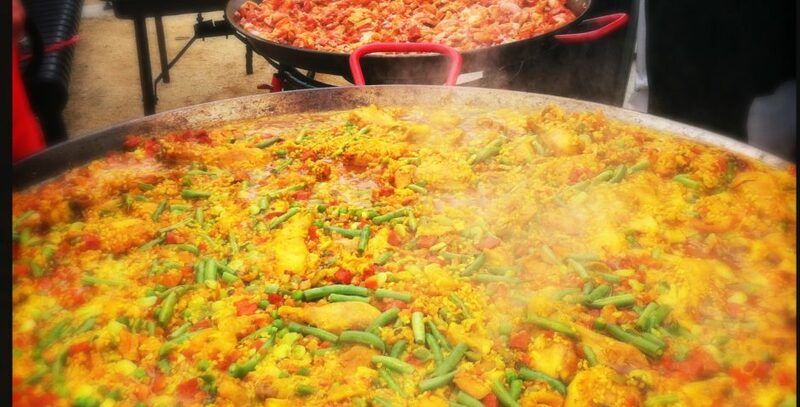 Jamie Oliver had done this one one of his programs and it’s hung around in one of the many nooks and crannies of my mind. Yes, there a lot of them and what Jamie was doing with them seemed so unique and so appealing, it’s been stuck in the noggin for a while. Jamie can make good tv for sure. But if I was to make preserved lemons, it wasn’t just about the lemons themselves. Well, at least in my mind. They had to be placed into an appropriate vessel, one worth of appreciation every time I saw them on the kitchen counter, slowly softening and reminding me to turn them daily. Cost Plus World Market had just what I was looking for: glass jars with an interesting shape, lids with a rubber gasket, and a cool metal clamp. So on a bright sunny southern California afternoon, I went about preserving my Meyer lemons. Cut, stuff with salt, stuff into jar, repeat. After no time at all, I had a pretty cool looking thing ready to sit and stew, so to speak. This is a Moroccan recipe. In a bowl mix the spices into the sea salt. Cut a cross into the lemons — almost to the base, but so that the quarters stay together. Push the seasoned salt into the lemon segments and pack the lemons as tightly as possible into an airtight jar. The less space there is between the lemons the more attractive it will look and you won’t need to use so much salt. The lemons will be ready after one month of preserving, and will last for about 2 years. One Response to Save a life…preserve a lemon! Lovey, we are making preserved lemons upon your recommendation! We’re not using your fancy spices though, so I’ll let you know how it turns out!